Reaction: After you win an challenge, kneel your faction card to search the top 10 cards of your deck for an in-faction event, reveal it, and add it to your hand. Shuffle your deck. The Road to Winterfell #38. 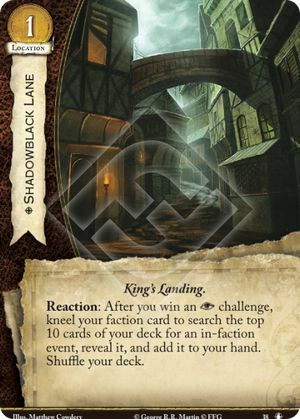 When Shadowblack specifies "in-faction event", it means one that corresponds to your Main faction only. For example, in a Lannister Banner to the Rose deck, you can take Treachery (a Lannister event), but not Growing Strong (a Tyrell event) or Tears of Lys (a neutral event).